Such and such and such is this. It feels good to be back in action. I have new bangs, a new hard drive. I just ripped most of the music off my ipod back onto my computer. It feels like home again. With 24 hour access to a computer back in my life, I can now finish my application to the creative writing program in a timely manner, do my homework in my own room, and download music. Two of those things are important. Also, once I reinstall Word, which I plan to do tonight when I get home, I can finally start working on my book again without it being a piecemeal attempt that only occurs under the influence of too much caffeine in the most remote corners of the computer lab on the third floor. Sighs of relief all around. I had a really awful scare yesterday when I was coming back from the grocery store: my mom called to tell me that my dad was laid off from his job. This is happening to so many people recently because of the state of the economy (which I will not go into because I don't want to have a panic attack) that I shouldn't have been all that surprised. And I guess it wasn't shocking exactly. It's just that he celebrated his ten year anniversary with the company about a month ago. It's the longest he's ever spent at a given job, and if there's no security in loyalty, then what does corporate America have left to offer? Anyway, this news inspired a mini-crisis, but only after I got off the phone with my mom and called my younger sister. Chrissie is a senior in high school and is nearing the final stages of applying to college for next fall. Naturally, she was freaking out about getting to college at all, so much so that the gas station attendant helping her asked her what was wrong while we were on the phone. Hearing her panic, I panicked. I am nearing the middle of my second year at school. Half a degree means nothing but failure. And if my family couldn't afford to send me to Hampshire anymore, where I have more grant money than I could imagine getting elsewhere, there was no way that going to a state school would alleviate financial pressure. In my brain, as it flew through hypothetical impending dooms, the worst case scenarios was losing my opportunity to finish school. I went to my workshop last night a distracted mess, leaving early because I was unable to collect myself. When I got home from class, I called my older sister Kaitlin, and she (always the rational one) talked me off of my ledge. Told me everything I already know, and some surprising things I did not. What company gives someone a reported eight-months'-pay severance package with health care? And a career counselor in addition to the opportunity of finding another job within the company? I didn't think anybody did such things, especially when they are outsourcing the entire department you once belonged to. In light of my sister's ability to be positive, and the full picture, I realized I needed to take a deep breath. James and I watched A Hard Day's Night and I went to bed fairly early. The crying was cathartic, but I have no desire to relive yesterday. Today was at the complete opposite end of the spectrum. I talked to my dad this morning on the phone and he seemed optimistic, ready to get out into the world and look for a job he actually enjoys doing. I finally got my computer back, in perfect working order, from the Apple store. I had a great class this afternoon. It was beautiful out. And for dinner I had a honey wheat English muffin with peanut butter and jelly. I am very, very happy right now. 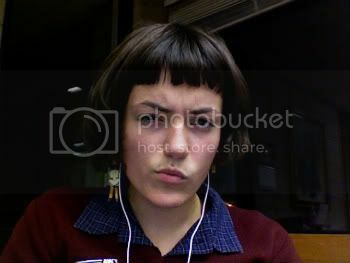 Unrelated random thought that needs addressing: I wonder if the other people in the library on Thursdays will ever notice me taking Photobooth pictures of myself out of boredom behind the reference desk.